Annalisa Ventola is a Columbus-based composer/performer immersed in classical piano and neo-classical pop art song. From J.S. Bach to John Cage, King Crimson to P.J. Harvey, Annalisa’s repertoire is as varied and complex as her personality. Having studied at the Ohio State University under Dr. Donald Gren (a protégé of Nadia Boulanger) and establishing her own teaching studio, Annalisa enjoys performing everywhere from the concert hall to the neighborhood bar. 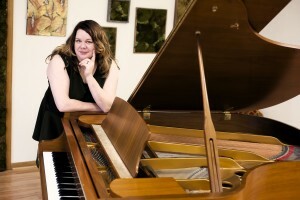 Her career in piano pedagogy began almost 20 years ago as a research assistant at the Music Cognition Laboratory in the Department of Psychology – OSU, where she assisted in experiments studying the learning, memory, and rhythmic responses of pianists. Having taught up to 30 students per week, some of whom have gone on to pursue their instruments through college, conservatory, and performance – Annalisa’s role as teacher is to help the student develop their own relationship with their instrument. Rather than imposing a particular method or program, she works with each students’ tastes and talents to help them set and meet their own performance goals. Following the success of her own performances of the Metamorphosis cycle for solo piano by Philip Glass in Spring of 2015, Annalisa is currently working on composing a song cycle and launched her first EP. A powerful, enigmatic and endlessly curious world traveler, Annalisa’s lifelong fascination with comparative religion, metaphysics and parapsychology provide her with a wealth of compositional subject matter. Make an appointment for a discounted first-time consultation or for a 30/60 minute session with Annalisa via our online booking form, or contact us for more information about our services.